Seamless navigation: a full suite of sensors enable your Roomba vacuuming robot to work its way in and around nooks and crannies of your home. Won't fall down stairs: Cliff-detect sensors allow the Roomba vacuuming robot to avoid stairs and other drop offs. 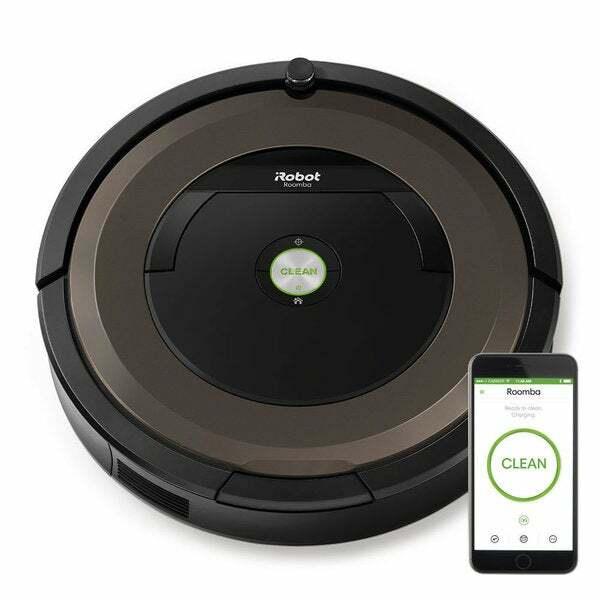 Automatically docks and recharges: Your Roomba vacuuming robot is always ready to clean because it automatically returns to its Home Base charging station between cleaning to recharge. Up to 50-percent more cleaning performance: The AeroForce 3-Stage Cleaning System uses Debris Extractors and the Gen 2 motor for improved cleaning performance and lower maintenance. Captures 99-percent of allergens, pollen, and particles: Traps particles as small as 10 microns with the AeroForce High-Efficiency Filter. iRobot love this Wi-Fi vacuum. Cleans my tile, carpet and hard wood flooring great. Might be too good since the dust bin fills up quickly but easy to empty and insert to get back to cleaning. Great to be able to start the process with not being home. Have to move items from floor. Happy that I do not have to push a vacuum! The robot does a very good job of cleaning carpets and floors. This is my second Roomba. Our other pet model Roomba finally quit after many years of cleaning up lots of pet hair. I chose this model based on the comments regarding the new type of solid rollers which were mentioned to be more effective and easier to clean. A huge issue with this new model is the way it destroys bath mats, throw rugs, door mats. I have tile, hardwood and carpet floors and it seems that this latest model doesn't handle changes in flooring very well. It goes over the mats and catches the edge and then it wraps all around the rollers. It then basically destroys the backing on the mat/rug. Also doesn't deal well with fringed rugs. This wasn't a problem with the older model. It does a great job cleaning up the pet hair, but if I forget to pick up the rugs, then I can be sure that one of them will be caught up by the Roomba somewhere along its' rounds. After buying the first edition of this style vacuum, I had my doubts but it did a better job then my upright ! 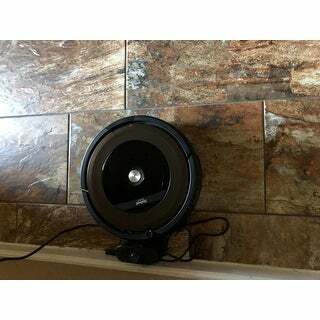 I'd say for sure this new 890 irobot with Bluetooth is the way to go with double the power of the older model..on hardwood flooring and carpet it cleans better the before and so easy to use .just push the button and it takes care of the rest even placing itself back to rechange ..very easy to use and understand.plug it it..put clean and stand back and watch the show! Thinking about this one.. you should go ahead and buy it .no regrets on my side with this brand!!! I wanted something that could do carpet, hardwood, and tile. my daughter commutes to school weekly and her husband is AF. so not a lot of time home to clean a big house. we charged the Roomba then let it do its job. I will say if you have a sliding glass door it can get stuck in the slides. transitions from floor types with ease, we played with the programs as well. set the timers, and ran it until it docked itself once it reached a certain level of charge. I highly recommend this product. I told others about where I ordered this product from because they were wanting one themselves. two thumbs up! Gave it it's first try today. Never left it's side as the cleaning process is very erratic. Finally starting utilizing the room barrier more and it helped somewhat. I would never put it on and leave the house. It does get stuck under certain surfaces. Frustrating to see it continually going over clean areas and passing those with dust particles. It seemed to take forever to get to them. I wouldn't use it for the kitchen any more as it is easier to just sweep the floor. Good for the carpet and wood floors in the living room. Hoping for good results in the bedrooms and under the bed. Just wish it had a better cleaning pattern. Was so excited to find this on overstock for same price as other retailers but when you use a coupon, you can seriously save some money! Not to mention the additional perks of club - o on top of it! I love love my rumba!!! I come home every day and the floor is clean, Its programmable so you can have it set for what ever time you want each day. The trash bin is large and easy to empty. Its easy to get replacement parts and easy to change them. I dont know how I lived with 2 great Danes and a bull dog before I got the rumba!! I wanted to love this vacuum in a house of 8 people with two pets this was the ideal vacuum.It would get stuck a lot under the tables and rugs. Would go in zigzag pattern and miss a lot of areas. Only comes with one Virtual wall barrier to divide the rooms. it’s hard to divide the house without buying extras. Overall return it. It works! Buy one, you won’t regret it. Bought this roomba December of 2017. Overall the machine runs fantastic! It's lasted a very long time considering we have two dogs that are heavy shedders. Quirks: sometimes when a small amount of dog hair is sensed at the bin opening, the unit believes it is full and returns to its base (once every 20-ish days). Filters do not last long and if they are not changed our regularly the machine doesn't operate to it's full capability. Again, we have two dogs that shed heavily; so please take this review as our machine is under heavy stress daily. I love this vacuum. Does all the work while I am not at home. This product is a time saver. We use this item in all rooms as it does well over rugs and under furniture. Wish the dirt cup was a bit larger, but we really like this! It cleans well but is a little noisy for me. I have seen other vacuums that are less noisy. "Is the Roomba 890 capable of cleaning multiple rooms?" Dependent on how big the rooms are and how much debris is on the floor, yes. My roomba does my complete downstairs, to include kitchen, hallway, living room dining room (small) and bathroom. Noise levels can be somewhat subjective- it would not be as loud as a vacuum cleaner, but its is also not silent. On a scale, it would be close to traffic noise. "Is the Dimensions: 18.7 in x 16.5 in x 5.5 in robot itself or package box? Cam I know the dimension of the robot itself?" This roomba itself is approximately 18.7 inches x 16.5 inches x 5.5 inches.